I really had fun making this dodo. The body started out like most of my animal sculptures, with a cardboard pattern and crumpled paper and masking tape. I intended to take a photo of the pattern, but I was having so much fun putting him together that I forgot to get out the camera. (Does that make me a dodo, too?) The tail was made with wire, burlap and plaster cloth. Once the armature was done, the experiments started. 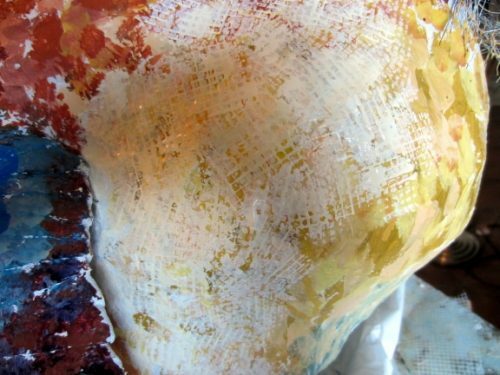 Instead of the usual paper mache, I used two layers of a very nice plaster cloth. (Hobby store plaster cloth doesn’t work nearly as well). I used the plaster instead of paper mache simply because everything is taking so long to dry this month, and I wanted to get those legs solidly cured so they would support the sculpture as I continued working on it. 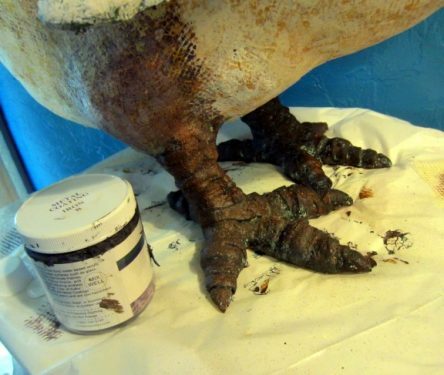 The plaster cloth also helped me make the scaled feet. After the plaster had a few days to cure, I added a very thin layer of paper mache clay to smooth everything out and create the detailing around te eyes and wing feathers. More drying time, and then I started to paint. The legs and feet were coated with bronze coating and iron coating, and spritzed with Tiffany green patina. The dark end of the beak was painted with iron coating, and spritzed with darkening patina, which, oddly enough, made nice light-colored spots. The metal coatings and patina were purchased online from brickintheyard.com. Wing detail, showing layers of color. Detail of stenciling through aluminum mesh. Great sculpt! Very inspirational…. Thanks for sharing your work! The dodo bird looks fantastic.Can i have the pattern? I’m planning to make a mini museum in our classroom about animals that are already instinct, and dodo bird is one. 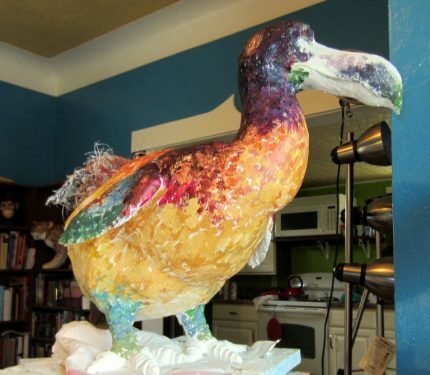 I didn’t make a pattern for the dodo – he was built freehand. (A pattern would have made the project go a lot faster, though…) If you’d like to see how patterns are made, check out this post. I hope that Erin’s dodo project came out well and on time for the graduation! Amazing bird, the colors and the shape are stunning! This is amazing! I came back to your site (after making the E.T. 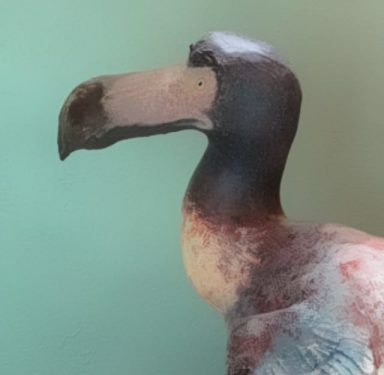 8 months ago) to find some tips and inspiration for making a Dodo bird for my sister’s PhD graduation gift (she has a Dodo bird tattoo to show her dedication to protecting wildlife). I started watching your mask making videos, then saw THIS!! I really wish you had taken more pictures of the process! 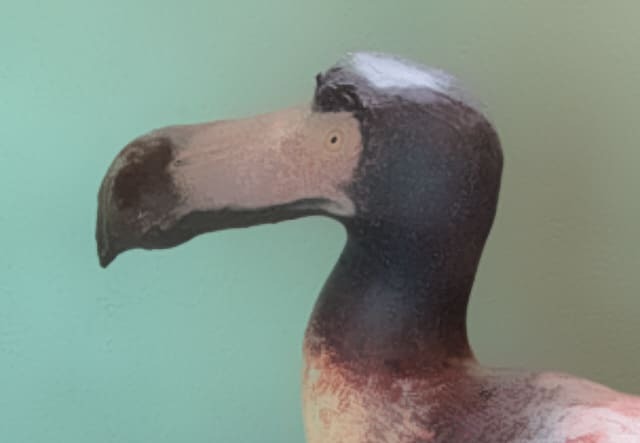 Which video tutorial or mask making techniques would you point me to for making a Dodo mask or a smaller Dodo sculpture? I have to make something in 5 days. What do you recommend?? The only thing I’ve made was that E.T. and it took me over 3 months! 5 days? ouch! But you can do it, if you’ve got a nice warm place and a fan for fast drying. The basics are the same as most of the animal sculptures on this site, which start as a flat cardboard pattern in the shape of the body, and two more patterns for the legs and wings. The roundness of the body was then filled in with crumpled paper and tape. In this case I also had to use some heavy wire to support the legs and body, because dodo only has two legs to stand on. A wire went from the end of a toe, up the leg, looped either towards the chest or towards the tail to give some support to the body, and then back down the other leg and to the end of a toe. I did this for all four toes on each foot, and then taped them all up. I made the tail with burlap, wire and plaster cloth, but I don’t recommend that you do that yourself. For one thing, the only painting done by an artist who had actually seen a dodo shows a bird with no fluffy tail. To be traditional and add the tail, use light cardboard, like I did for the wings on the hummingbird. It’s so much easier. Since I was having a hard time getting things to dry in my little house, I used some good plaster cloth to create a solid “skin” after the armature was all padded out with paper and masking tape (and crumpled aluminum foil down the toes.) The plaster cloth was wound around the toes and the legs, and a few inches out onto the body. Then I made sure he was standing up nicely and allowed the plaster to get solid before working on the rest of the body. I used two pieces of plaster cloth on all of him, and then let him cure overnight. 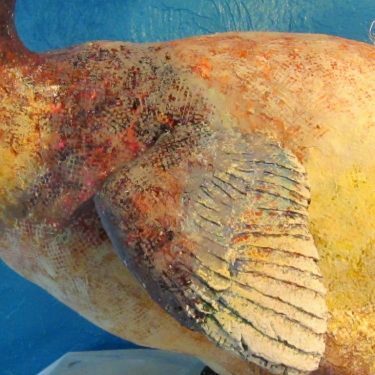 A very thin layer of paper mache clay was then put over that, but if you’re in a real hurry (and if you were really careful with the plaster cloth) you could skip the paper mache clay and just paint your dodo. 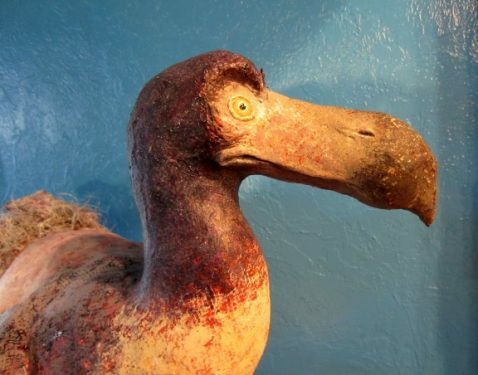 Yeah, the more I think about it, the more I think I’ll make a Dodo mask. That should take less time, right? Even if I haven’t made a mask before? Or I could make a really small Dodo like your awesome little Hummingbird!!! That can be done in a few days, right? The hummingbird only took a few hours, because I dried it in a warm oven. A mask could be done in a few days, if you follow the techniques I use in my mask book. You can see the process in detail if you watch the videos I made for the Pantalone mask, including the recipes for the paste and gesso. If you sign in to amazon.com and do a search inside my mask book (go to page 44) you can see that I made the beak out of aluminum foil and then removed it when the paper mache was dry. Good luck. And you’d better get started now if you only have 4 days left! Wow! Your dodo is amazing. I love how you painted him with patinas and iron. Truly magnificent!!! I like that you used the plater cloth first. I may have to try that some time. Thanks for always inspiring me. 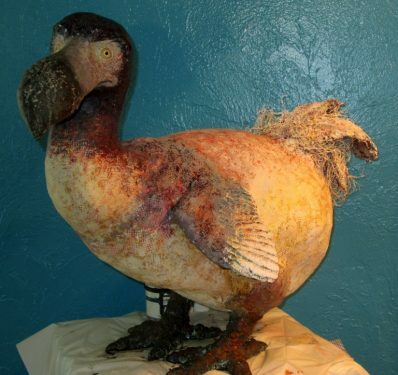 Oh JONNI…….Only you could make a DODO bird look so loveable ! This turned out perfectly. It’s another awesome display of your artistic prowess. Good to see you back in creative mode after the big move. Hope to see more of your creations soon. Anything in mind yet? What happened with the Iroquois mask idea you had mentioned before? I discovered by just a little more research that the Iroquois might be a bit insulted if I directly copied their masks – they have more spiritual significance than I realized. I still love the idea of characters, though, and I will soon start on my next book. The working title will be “Capturing Character and Expressions in Mixed-Media Sculpture,” or something to that effect. It will give me an excuse to play around with faces, and I think it will be a lot of fun. I will be moving in about two months (I just made an offer on a house), and the new place will have better lighting and way more room. There should be room for making videos, too, which I can’t do in the house I’m currently renting. I miss making the video tutorials, and I’m anxious to get back to it. Stay tuned! A new book!!! That’s great!! 🙂 I’ll have to keep my eyes out for it when it comes out. I have both your books already and absolutely treasure them for the inspiration that they provide. Personally I absolutely hate moving so I can’t imagine having to pack up and move again after just having moved not so long ago. For me, part of it is that I’ve accumulated quite a bit of posessions and hate to have to pack em up. The other part is that, as an artist who has a lot of personal artwork, I tend to stress a lot over the safety in moving of said artwork. But the positives in your move are that you’ll have more space to create larger pieces (That Dodo needs some roaming space as does your elephant.) and you’ll be able to go back to making video tutorials. Trust me, as much as you miss doing them, we miss watching them. I was actually going to mention that in my original post but didn’t want to be too pushy. 😉 Did you find a place that was closer to your daughter? On another note I wanted to ask you a question about your version 2 of the paper mache clay. I didn’t want to start a new post in the old blog post so I thought I’d just do it here while I’m at it. I saw the video and I think you mentioned that Version 2 doesn’t stick too well to the version 1, is that only because you didn’t use the elmer’s glue in the recipe but where using rich’s glue formula. I’m getting ready to order some powdered clay and want to make sure that my project will work out for what I need, which is something that will take texture well. Finally, in an unrelated topic, I thought I’d ask you since I know you have your own facebook art page, how did you go about setting up an art page? Is it the same as setting up a regular personal account or is it something that is linked to your personal account? I haven’t been on facebook for over a year and a half but it seems to be the place to get some more exposure. Please advise. Hi Jose. Yes, I did find a place closer to my daughter, which is nice. I really do like South Dakota – much more than I thought I would. The people are really nice, and there’s a great library and art center here. But moving isn’t much fun, is it? Lately, I’ve been adding 1/4 cup of wet low-fire white pottery clay to my mix, using slightly less paper, and using corn starch instead of flour. It starts out like frosting, just like the original recipe, but after sitting in a covered container overnight it becomes thicker, more like “real” clay. (The powdered clay could be used, too, as I did in the video series I did a while back, but my bag of powdered clay is hiding in a box somewhere in the back of the garage. The wet clay was easier to buy, and a 25 pound bag will last for a very long time). This version does stick to the underlying layer, but isn’t as sticky as the original recipe. I like the way it comes out right when it’s mixed for covering a lot of area quickly, like I did on the dodo’s body and wings. The next day it’s perfect for details like the eyes. Do try it if you get a chance – it can be textured easily, and is nice to work with. If you do try it, be sure to let us know how it turns out. For Facebook, I’m the wrong person to ask. I have two pages, but I have no idea why. I’ll try to see if my daughter can help answer this – I still haven’t figured out Facebook, and it just makes me tired thinking about it. I’m glad to hear you’re liking your new surroundings. And don’t get me started about moving. I guess my hate of it started because during my second year as a teacher, I was working at a year round school and didn’t have my own classroom, as in place to call my own. The way it works is that I would end up having to use a classroom from a teacher and class who were on vacation. They arranged so I had a place to be in the entire year but I ended up having to move every 6 weeks for an entire school year. As a teacher you accumulate lots of things and are expected to have a neat and organized environment so it was no fun having to put up stuff and then bring everything down again every six weeks. Just thinking aboutit makes me shudder but luckily I survived with my sanity intact. I got my box of powdered clay the other day. I didn’t invest in a large supply like you did. I thought I’d give it a try with the type of clay that I got first and see how it goes. I’ll let you know/see my results when I get something done. So I owe it to you somewhat. Now I just have to figure out how to get people to see my page and get more likes. Instead of making a mask that may inadvertently mock Iroquois religious beliefs, how about a mask of an historic Iroquois person? There are plenty of public domain paintings and photographs of Native peoples to use as a respectful model with an homage to history. Very cute – but whose Brick in the Yard? This reminds me of the the big bird sculpture I copied from a book entitled Paper Mache Today. She sat on two large eggs for hatching and had a long neck and yellow beak. I finally had to get rid of it when her toes began to come off as I didn’t have a place big enough for it to rest without it being disturbed. This was some site to behold as you entered my kitchen. There Big Bird sat in all her glory – I miss her now for she is gone. It sounds like your kitchen may need a new bird. I can only make small things from now on, until I move into my new house. NO room! Brick in the Yard is the company that I linked to in the article. They sell mod materials and other art supplies. I think he turned out awesome and I couldn’t agree more with everyone else. Your talents at this are amazing. You are amazing! Love this fun bird! You mentioned “very nice plaster cloth”. Did you make it yourself? Are there instructions someplace? No, I don’t know how to make it. I ordered it online from the Brick in the Yard folks (link in the article). You can also buy medical-grade plaster cloth from Amazon.com. Once you use it, you can’t go back to the hobby store stuff. I agree, I bought medical grade plaster cloth from a medical supply store in the eighties and had that for years and years. The quality was spectacular. I bought the craft store version and my projects did not come out as nice as the the ones I bought at the medical store. Now that I know where to order them, I will do just that. I think he’s absolutely hilarous! Great work!